If anyone ever doubts the origin of energy at a performance, just look to those younger attendees. You will find your lost inner child there, and maybe a little of your missing ingenuousness. 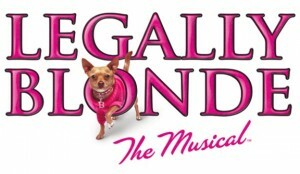 At the Boston Children’s Theatre Studio 3 presentation of LEGALLY BLONDE, at the historical Governor’s Academy in Byfield on Thursday evening, the 12th of July, I was swept on a tide of kids’ insouciant ebullience, just getting to the doors. The under-16 crowd of alternate cast performers and friends seemed to far outnumber the adults present. I knew then that I was in for a very high-energy show. There are enough children associated with this production that they had to be divided into two equal-sized casts of 38, counting the dogs. On Thursday, I saw Cast Rufus. They and Cast Bruiser would perform alternate shows through the weekend. Mounting a performance with total of 76 performers (by my count. The website lists only 66) is a huge undertaking. Kudos to the BCT staff and to director Lisa Yuen for managing it. Ms. Yuen did a good job making it all work, without letting it look like the huge task it was. The Wilkie Center, the theatrical facility on the Governor’s Academy campus, is a very dynamic, “live” space. Conversations held low by audience members in one part of the space will come to any other part of the space as ambient sound. From the stage, however, conversations are clear, like a mini Symphony Hall. Which presents a problem. Sounds of a performance there need to be carefully modulated, so that one does not overpower another. The 5-piece band led by Nathaniel Beliveau does a fine job of staying right with the action. At times, however, the percussion overwhelmed the vocalists; even the chorus. Especially house right. Where I sat. For the first act. Sound for the second act was better, after I moved house left. Another thing to recommend this space: the band can completely disappear from view without removing sound. For this show, they were tucked high into the house right wall. Brilliant. And since I’m on about technical brilliance, I love Janie Howland’s set. Bright red panels and curtains, bi-levels, stepped tiers, and rotating reveals all fill the stage, with enough room to allow larger set pieces to emerge and retreat easily. I think the set could have been better used by the choral elements of the performance, but the director did a creditable job of filling the space. Beautifully, in the second act, in an emulation of Romeo and Juliet with the Elle/Emmet duet, with Elle above and Emmet below. Cast Rufus was led by Dierdre Pedersen as the Elle Woods ingénue. It’s a big, demanding role, and Dierdre made it hers. I always wanted more volume from the young woman’s sometimes reserved vocal performance, however. The band and chorus often inadvertently overpowered her, vocally, as did duet partners and chorus, on occasion. I must say that in Act II she found her stride in duets with Nikolaj Bies as Warner, and with Brendan Callahan, as Emmet, the eventual love interest. Emmet’s whip-smart earnestness, by the way, was handled very well by Callahan. And Warner, rather than being the completely self-interested snob, as he has been in other productions, was portrayed well with some pathos as a misguided young man learning how to take charge of himself. Oh, sure, the show has its drawbacks. What show doesn’t? But I didn’t go there expecting professional quality at all points. The Harvard law students would do well to choose which piece of paper on the bulletin board is the all-important Prof. Callahan’s List. I’m glad that everyone managed to avoid getting mashed by the prematurely opening big, red set panel. Enunciation cannot be overstressed. Bit lighter on the drums, please (I just can’t seem to get past that, huh? Sorry.) And it will, naturally, take a few years of real-life experience to acquire and comprehend the utter emotional devastation of betrayal, the deliberate wickedness, the high of joyful anticipation, the ineluctable gravity of young love, that this show calls for. But if you step back, don’t look so closely, you will see the beginnings of all of these in the very young cast. I need to mention a few outstanding moments and performers. There is an introduction of a character, worthy of a star cameo. When the UPS driver who becomes a love interest for the star’s new best friend, Paulette, made his entrance, I wanted a separate musical theme. He pulled off a runway strut that would have done Fabio proud. And Paulette was played with amazing conviction and skill by Margaret McFadden. This young lady might be one to watch for in the future. One last outstanding moment I wish to acknowledge is FUN. The cast very obviously has FUN with this show, and it is infectious. This entry was posted in Musicals and Opera and tagged Boston Children's Theatre, Brendan Callahan, Byfield, Dierdre Pedersen, Governor's Academy, Lisa Yuen, MA, Miss Saigon, Nikolaj Bies, sound pockets, Studio 3, summer, talented young cast by johnherring. Bookmark the permalink.